In the 1950s, part of the elusive American Dream was being able to buy the perfect home. For many, their dream homes were often suburban ranches with four or five bedrooms, a two-car garage, a lovely backyard, looking for a kitchen remodel, dining, and living room, and a beautiful master suite. Fast-forward to today, however, and you’ll find that that dream has changed for many Americans. Living lavishly and luxuriously isn’t exactly the popular norm. Sure, there are still the select percent who want sprawling homes, but for the majority that isn’t necessarily the reality. For the millennials, what you can acquire and own becomes less and less important every day. The idea of minimalism, focusing on life experiences, and seeing the world have become the values of today’s generation. Enter tiny house living. But still the design should look nice, I have small house but I was doing our new kitchen design at Floform and now it looks so beautiful. In exchange for those 1950s ranches, people have begun paring down their lives and possessions and opting to live in homes that are no larger than 400 square feet. These homeowners see tiny homes as the perfect way to cut back on the expenses and upkeep of a larger home, so they can focus their time and money on other, more important things in life. While some have taken to the tiny home lifestyle quite well and wouldn’t go back, it’s not a move that’s suited for everyone. 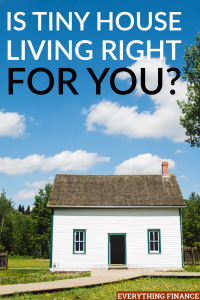 So how do you know if tiny house living is right for you? Here are a few things to consider before moving into a smaller space yourself. Are You Hoping to Save Money? Quite possibly the biggest reason people opt for a tiny house is the cost. The home itself only costs anywhere between $20,000 and $60,000 (if you’re really getting fancy), which is significantly lower than even the down payment on a larger home. Moreover, because it’s small, you’ll also spend a lot less on utilities. You won’t need to use as many of the resources that you would in a larger home. This means you could spend as little as $30 on your basic utilities. If you’re hoping to use the majority of your money for other things that aren’t your home, tiny house living might be a good solution. Tiny homes are just that, tiny. If you’re a single person, you’ll have no problem making a tiny home work. However, if you’re married or have children, you might want to seriously consider whether or not it’s the right move for you. When you have multiple members of a family, it can be imperative that everyone at least have a little space of their own; a tiny home can’t provide that, which means you might be on top of one another all the time. On the other hand, if you’re single or someone who is always on the go or traveling a lot, a tiny home might be just what you need. Another major pull for the tiny home movement is its environmental friendliness. That being said, tiny homes don’t always have the same necessities or options a regular home might. For example, you might have to use a composting toilet instead of regular plumbing, or you might need electrical hookups, or you might not have room for a washer and dryer. Consider the fact that these might be things you’ll have to deal with and decide whether or not you can live without them or go about basic necessities a little more difficultly. You’ll also have to seriously minimize your possessions. Think through the items you can’t live without. If the list is too big or you can’t get rid of a handful of items, a tiny home isn’t for you. Have you ever thought about all the time you spend or would spend on the upkeep of a normal-sized home? There’s a lot to it. Between lawn care, cleaning, and other basic upkeep tasks taking care of a home is almost a full-time job. Tiny homes don’t require near the upkeep, which means your time could be used for far better things. Moreover, the time spent on home upkeep is especially not worth it if you’re the type of person who is rarely home. Depending on your preference, you can either move your tiny home on the regular to wherever you’d like to go, or place it in a tiny home-specific community within your city or state. That being said, not all cities or states allow such communities, so if you live somewhere you love that doesn’t allow that, consider whether or not it’s worth it to move. Furthermore, since you have limited space within your home, many tiny homeowners find that their outdoors is of vital importance. You’ll likely find that you need a great deck or porch to supplement the missing space inside. If you live someplace that gets extremely cold or extremely hot, however, you might not be able to enjoy as much outside time as you like. Carefully consider your environment and where you’d like to live when considering a tiny home. Could it De-stress Your Life? The cost and care of large homes, the monthly mortgage, and even the constant upkeep of so many possessions can be an extremely stressful part of life. Hence the idea behind tiny house living. Downsizing your home and life gives you a more affordable and less-stressful life track. It might also mean spending time doing the things you really care about and love. If a more minimalist lifestyle seems like a well-worth it move, than tiny home living might be for you. Just because some people find joy and simplicity in tiny homes, doesn’t mean it’s a move that’s necessarily for you. After all, minimizing your life is a big decision. That’s why it’s important to thoroughly think through your lifestyle, situation, and what truly makes you happy. You might find that a tiny home is your dream home, or you might decide to stay right where you are. Have you considered tiny house living? What are some of the pros and cons you’ve found?